Groover is an ad-supported application that generates advertisements labeled “Powered by Groover”, “Ads by Groover”, “Groover Ads”, and similar. It was developed by Cupuacu Labs is promoted as a tool that can help you “get the most out of your online shopping”. Unfortunately, the program does not differ from any other adware. It spreads online using a deceptive distribution method called bundling and after it enters your PC, it starts flooding you with ads. The software is compatible with all popular browsers including Google Chrome, Mozilla Firefox, Safari, Internet Explorer, and others, so you will not be able to avoid its commercial data. If you want to get rid of Groover Ads, you will have to delete the program that generates them. 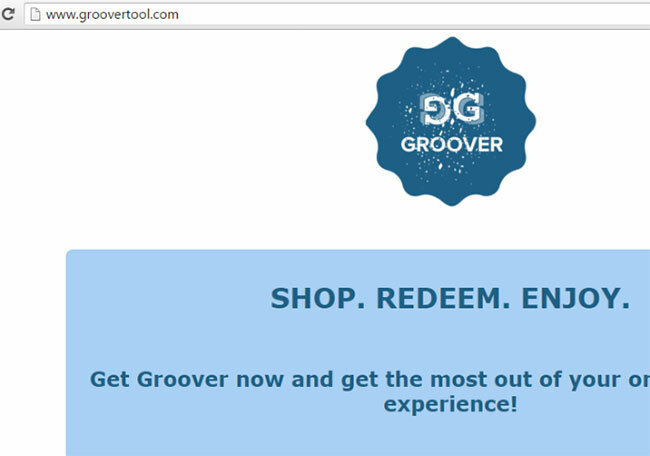 As it has already been mentioned, Groover gets distributed in free software bundles. This distribution method is not completely fair, because often computer users do not pay enough attention to the installation of freeware and shareware. You should do that, however, if you want to avoid potentially unwanted applications like adware and browser hijackers in the future. These programs are presented to you as additional offers in the wizard. They can be declined. In order to do so, you need to choose the Custom or Advanced installation mode instead of the Regular or Recommended one. The advanced mode will allow you to deselect all components that are unnecessary to you and only install the software that you actually need. Once the adware gets installed, it starts automatically each time that you turn on your computer. It will not take you long to notice its effects. Your browsers will be flooded with various types of advertisements including in-text ads, coupons, pop-ups, pop-unders, banners, and so on. Some of these ads will be based on your browsing history, which means that the program also tracks your cookies. What you should know is that the commercial content shown to you is not endorsed by the application. It could be fake and lead you to unsafe websites. If you do not want to risk you computer and personal data safety for no reason, you should eliminate Groover Ads from your browsers. How to remove Groover Ads? You can erase Groover Ads by uninstalling the adware from your computer and deleting its extension from your browsers. These tasks can be completed manually or automatically. Automatic Groover Ads removal is a much more reliable choice, which is why we suggest that you go with it. Download the anti-malware tool from our page and use it to terminate Groover Ads along with other unwanted files and applications for good. Moreover, the security tool comes with other beneficial features such as real-time online protection, so it will shield your PC from various threats you may encounter while surfing the Internet. Alternatively, you can delete Groover Ads manually by using the instructions that are presented right below this chapter.